Regardless of whether it is a new build or a change of use into multi-occupied flats, they have to be constructed to be in compliance with the Approved Document E Resistance to the Passage of Sound. This means the buildings have to be soundproofed to minimum levels to ensure that the occupants are not subjected to undue noise nuisance from their neighbours. Commonly used halls and stairways are included in this and they have to include adequate soundproofing of the stairs, walls and landings along with sound absorption within those areas. In theory, this means that the walls and floors should have a minimum airborne insulation value and the floors and landings a maximum impact noise level. For new build these are 45dB for airborne and 62dB for impact and for buildings the subject of a change of use they are 43dB for airborne noise and 64dB for impact noise. 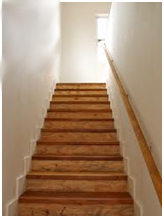 WHEN IS SOUNDPROOFING OF STAIRS NECESSARY? Because there is more difficulty in attaining this in buildings the subject of a change of use, this article will concentrate on those. For new build there are already tried and tested systems in place that can easily be written into the design by the architect simply by consulting the Approved Document E or Robust Detail Standards. Robust Detail is only applicable to new build so we will not discuss that in this article. Now you are probably thinking how do I go about meeting the noise control requirements of stairs in common areas of flats that are in the process of being converted? Well, we will start with the underside of the stairs and where these may be inside a flat the underside should be soundproofed as follows. 1. Screw Acoustic Plasterboard to the underside of the stairs. 2. Fix timber stud to the Acoustic Plasterboard and infill with the correct thickness of Acoustic Mineral Wool. 3. Screw to the stud a double thickness of 15mm Acoustic Plasterboard to finish off . 4. Stairs that have been constructed with the underside inside another flat should also be boxed in with a cupboard clad with a double thickness of Acoustic Plasterboard and fitted with a small, well fitted door for access. 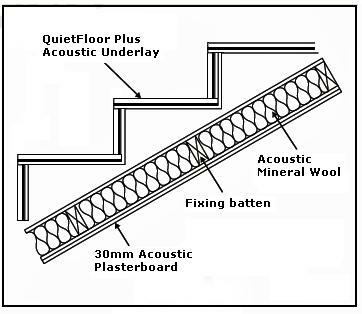 Beneath landings and passageways if above a living area should also have a double thickness of 15mm Acoustic Plasterboard fixed to the ceiling and decoupled from the joists with Resilient Bars after 100mm of Acoustic Mineral Wool has been loosely installed between the joists. Now, for on top of the stairs, halls and landings in common or shared areas to give access to flats. The stairs should be covered with an underlay that has to be glued down and for best results onto the risers as well to absorb frontal impact from feet. The best underlay for this is our 15mm QuietFloor Plus Acoustic Underlay for carpets and some other hard floor coverings. Stair carpet can then be installed on top of this as normal with no additional underlay. The same QuietFloor Plus can be used on the landings and passageways and as long as it is glued down, replaces the normal acoustic floating floors that should be used. Separating walls of stairways and corridors also have to be upgraded to meet Part E compliance but due to the limited space often available, this is difficult to achieve. 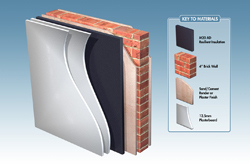 But we can offer a solution that is only 45 – 50mm thick and is our 20mm M20AD recycled rubber soundproofing system for walls that comprise the sound insulation covered with either 25mm or for better results, 30mm of Acoustic Plasterboard and all of the layers are simply glued to the existing walls. Reverberation is the last thing we will deal with in this article and the regulations for noise control also stipulate that provision must be made to install sound absorbing materials that will reduce airborne noise nuisance that would otherwise disturb neighbours. The best and most cost effective product that can be used for this is to install our 30mm Echosorption Plus sound absorbing tiles onto the ceilings. Echosorption Plus is a white finished tile each 1200 x 600mm with chamfered edges and are easily applied using a good quality contact adhesive. That’s it. If the above is followed to the letter your common stairs and hallways in newly converted flats will then comply with the requirements of Approved Document E for the control of noise through separating floors and walls.